What Would Eleanor Roosevelt Tell Us? Nancy Woloch is a member of the history department at Barnard College, Columbia University. 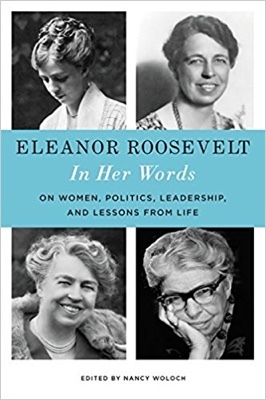 Her latest book is Eleanor Roosevelt: In Her Words: On Women, Politics, Leadership, and Lessons from Life. Eleanor Roosevelt had more than one professional life. Enmeshed with her accomplishment in politics and diplomacy was a complementary career as journalist, lecturer, broadcaster, and public personality. ER wrote incessantly. Her body of writing—and speaking—was prodigious. She reached a mass audience through magazine articles, newspaper columns, and radio talks. From the 1920s into the 1960s, ER both generated news and wrote about it. Ambitious and competitive, she dealt continually with deadlines and agents, publishers and editors, radio stations and corporate sponsors. The upshot: much that ER achieved in public affairs had double resonance, in life and in print. Her huge written legacy, so astutely mined by biographers, speaks to the present moment. ER wrote and spoke about subjects of enduring interest—about women’s role in society and politics; about education, race, labor rights, civil rights, human rights, and world peace; and about human emotions and interpersonal relations. Almost every topic she touched, even if somewhat “dated,” as is often the case, connects in some way with modern readers—from her advice on marriage to her assault on Soviet intransigence at the UN—to say nothing of her many responses to the question “Can a Woman Become President?” (As of 1940, “No.”) Dismissing “the America First people,” she pressed for international understanding. Taking aim at bias and bigots, she endorsed “the four equalities”: voting rights, equal education, equal opportunity, and justice before the law. What motifs pervade ER’s vast outpouring? One is personal narrative. In no small part, ER wrote about herself. Beyond three impressive memoirs, plus a fourth that melds the first three, ER infused her other writings with facets of her life story. Early memories and childhood experiences flood her columns and articles. She often mentioned her notable family, her adored father, and her famous uncle, Theodore Roosevelt. She recalled her beloved teacher, Marie Souvestre; her domineering mother-in-law; and the impact of the Roosevelts’ talented political advisor, Louis M. Howe. She reflected on her relationship with FDR and after his death rewove it by speaking for FDR. At once candid and evasive, self-effacing and dramatic, ER found many ways to share her backstory, or legend. Another motif was educational process. Always a teacher and always a gifted student, ER underscored the imperative of learning from experience. The main axiom of progressive education – to learn by doing—was central to her credo. So was educational philosopher John Dewey’s basic tenet (unacknowledged) that learning meant a continual process of restructuring and reorganizing, or in ER’s rendition, “readjustment.” To ER, as to Dewey, the gist of education involved learning how to learn. Touting the value of curiosity and looking back on her own example, ER stressed the importance of learning from experience and of readjustment; she merged learning theory with popular advice. Finally, and most extensively, ER expounded on democratic values. Her arguments drew on her commitment to labor rights, civil rights, and human rights; on her beliefs about the interdependence of people and nations; and on her enmity to totalitarianism. She spoke at once to her contemporaries and to posterity. To listen to ER defend democratic values right now – at a time when the executive branch is anti-labor, anti-regulatory, anti-internationalist, and overwhelmingly anti-New Deal—induces shock.